U.S. shipments of residential gas storage water heaters for May 2017 increased 5.5 percent to 359,724 units, up from 340,984 units shipped in May 2016. 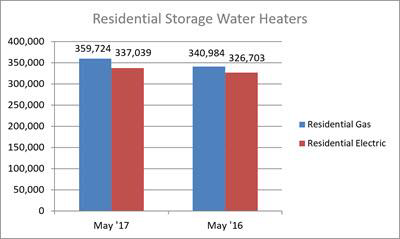 Residential electric storage water heater shipments increased 3.2 percent in May 2017 to 337,039 units, up from 326,703 units shipped in May 2016. For the year-to-date, U.S. shipments of residential gas storage water heaters increased 4.3 percent to 1,868,432, compared to 1,791,181 shipped during that same period in 2016. Residential electric storage water heater shipments increased 5.5 percent year-to-date to 1,757,514 units, compared to 1,665,930 shipped during the same period in 2016. Commercial gas storage water heater shipments decreased 1.9 percent in May 2017 to 8,309 units, down from 8,474 units shipped in May 2016. 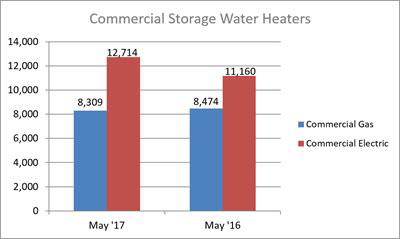 Commercial electric storage water heater shipments increased 13.9 percent in May 2017 to 12,714 units, up from 11,160 units shipped in May 2016. Year-to-date U.S. shipments of commercial gas storage water heaters decreased 5.2 percent to 40,690 units, compared with 42,925 units shipped during the same period in 2016. Year-to-date commercial electric storage water heater shipments increased 14.6 percent to 58,552 units, up from 51,078 units shipped during the same period in 2016. 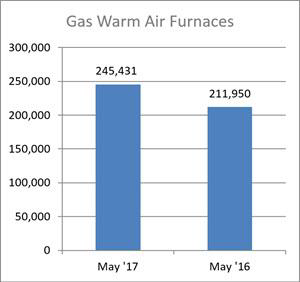 U.S. shipments of gas warm air furnaces for May 2017 increased 15.8 percent to 245,431 units, up from 211,950 units shipped in May 2016. 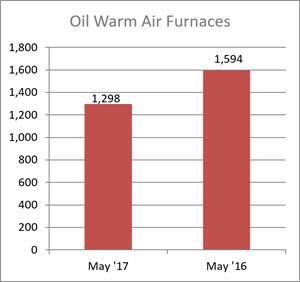 Oil warm air furnace shipments decreased 18.6 percent to 1,298 units in May 2017, down from 1,594 units shipped in May 2016. Year-to-date U.S. shipments of gas warm air furnaces increased 10 percent to 1,115,264 units, compared with 1,014,193 units shipped during the same period in 2016. Year-to-date U.S. shipments of oil warm air furnaces decreased 5.6 percent to 10,434 units, compared with 11,049 units shipped during the same period in 2016. 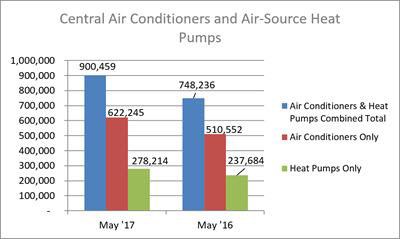 U.S. shipments of central air conditioners and air-source heat pumps totaled 900,459 units in May 2017, up 20.3 percent from 748,236 units shipped in May 2016. U.S. shipments of air conditioners increased 21.9 percent to 622,245 units, up from 510,552 units shipped in May 2016. U.S. shipments of air-source heat pumps increased 17.1 percent to 278,214 units, up from 237,684 units shipped in May 2016. Year-to-date combined shipments of central air conditioners and air-source heat pumps increased 11.4 percent to 3,304,902, up from 2,967,102 units shipped in May 2016. Year-todate shipments of central air conditioners increased 11.2 percent to 2,170,669 units, up from 1,952,676 units shipped during the same period in 2016. The year-to-date total for heat pump shipments increased 11.8 percent to 1,134,233 units, up from 1,014,426 units shipped during the same period in 2016.